If the White House wants to push federal workers out of public service, this is one way to do it. President Donald Trump has refused to sign any appropriations bill that does not include $5.7 billion for a wall along the U.S.-Mexico border — leaving 800,000 federal workers without pay since Dec. 22. Brenda Meskunas was furloughed from her job with the Department of Homeland Security last month, forcing her to apply for unemployment insurance in Ohio to cover her bills. To qualify for the benefits, Meskunas had to demonstrate to the state that she’s actively seeking work. So she applied for two administrative jobs in the private sector. They both pay better than her current position. They might lack job security, but federal government paychecks aren’t reliable either these days. For workers like her, one of the most worrying effects of the record-setting partial government shutdown is the way in which it’s making civil service less attractive. President Donald Trump’s demand that Congress provide $5.7 billion for a wall along the U.S.-Mexico border has led to the furlough of 380,000 federal workers, and an additional 420,000 deemed “excepted” have been working without pay. The shutdown marked its 31st day Monday, making it at least 10 days longer than the previous record. Nine of 15 agencies and roughly a quarter of government functions are affected by the lapse in funding. If the Trump administration really wants to diminish the federal workforce, a prolonged and painful shutdown could help toward that goal. Whether they’re longtime civil servants or relatively new to the government workforce, many federal employees feel less secure and less valued each day they’re locked out of their jobs. The uncertainty could easily lead many of the most productive employees to leave government for other work or could discourage some of the brighter prospects from ever applying. “We’re going to see the fallout from this for a while,” Meskunas predicted. Grinding away at federal job security has been a hallmark of the Trump administration. Last year the White House issued a handful of executive orders aimed at weakening collective bargaining rights and making it easier to fire government workers. Key portions of those orders were blocked by a federal judge. The administration has also sought a pay freeze for civilian federal employees, resetting an automatic across-the-board raise to zero, and considered cutting federal worker pensions. Trump called federal employees working without pay “great patriots” on Sunday. But he also insulted furloughed workers last week, even as many are forced to seek loans from family members or accept food giveaways to feed their children. 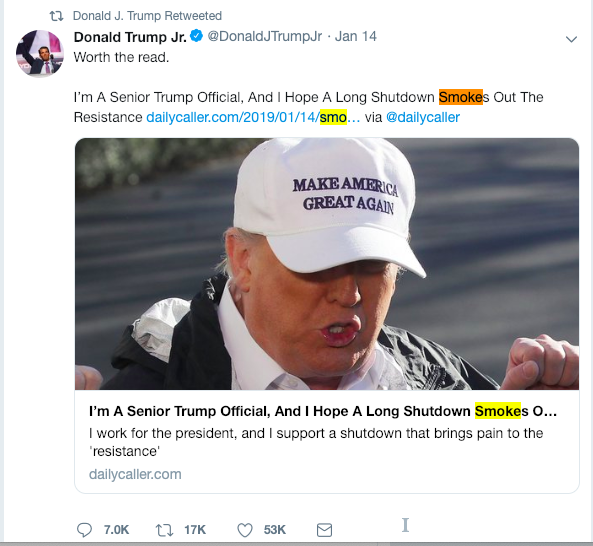 He retweeted a column from The Daily Caller, attributed to an anonymous Trump official, arguing that the shutdown is a good thing because the majority of federal workers don’t do anything. To the unions representing federal employees, it often feels as if the Trump administration is at war with its own workforce. Despite their middle-class wages, federal workers have found themselves lumped in with the Washington “swamp” that needs draining. Never mind that most federal workers don’t even live in the D.C. area. “They know that this administration is hostile to them and their work,” said Jacque Simon, the political director at the American Federation of Government Employees, a union representing 700,000 federal employees. Even so, she said she is not overly worried about workers being discouraged from entering civil service, despite the current uncertainties. The sense of public service is part of what attracted Rick Fernandes to government work. An Army veteran who served in Iraq, he said he made excellent money selling insurance but decided to seek out a stable federal job instead. He took a vast pay cut when he accepted a position with the Interior Department in Nevada. He figured the job security and sense of purpose could make up for the loss in salary. After just a year and three months on the job, he has experienced three government shutdowns already. The first, last January, lasted three days, and the second, in February, just a few hours. Like the current one, both of those were due to lapses in government funding. Even though they were short-lived, those shutdowns still diverted federal agencies from their core missions by forcing them to develop contingency plans and prep for furloughs. The current shutdown has made clear to Fernandes that his livelihood will be used as leverage in political fights. Without any savings, he might have to seek a second job in order to be prepared for more shutdowns. As the shutdown nears the one-month mark, it still isn’t obvious how it will come to an end. Trump has offered to restore protections for certain undocumented immigrants and refugees after previously moving to restrict them but is still demanding $5.7 billion for a border wall that he used to say Mexico would pay for. Most Democrats quickly dismissed that offer, insisting that Trump agree to reopen shuttered agencies before bargaining over border security. Meanwhile, furloughed workers like Meskunas are at home tracking the news closely, waiting for any sign of a breakthrough to get them back on the job. At least until the next shutdown, anyway.